Karen Newell, a parent of a child with vision impairment (VI), reviews the Osmo Explorer Kit that promises that children with learn while playing. With the advertising promising “Play and learning beyond the screen”, I was really keen to find out more about the Osmo and see how accessible it was for my visually impaired eight-year-old Fred and his sighted sister. Fred already sees iPads, computers and other devices as an integral part of his life. He was very lucky to have been gifted an iPad for use at home from Guide Dogs. We received the Osmo to review for the updated Toy and Play Guide that I’m currently working on for RNIB. The mini reviewers were set. We were sent the Explorer Kit and it contains a whole heap of interactive fun. There are other kits so you can choose the combination of games suits your children. The Kit includes an Osmo iPad base, camera clip (which directs the camera 90 degrees down) and five games with accompanying hands-on playing pieces. You can buy the base separately for £29, download the apps and build your own bespoke kit. It’s currently available only on iOS and is suitable for kids aged five to 12. The Kit costs £189 and doesn't include an iPad. The setup is pretty simple. Just download the app on your iPad, pop the red camera clip on to activate your camera in the right direction and place the white drawing board in front of it. The Monster (Fred thought it looked more like a Yeti) is really friendly and asks questions, inviting you to play. He asks you to draw an item such as an umbrella, a cake or a tree on the board using the pen provided. The audio clues are good for all levels of sight and it gives you enough time, so there’s no rushing your masterpiece! Once you have drawn the object or background, you press the button on the iPad screen and voilà! The Monster then seemingly pulls the picture onto the screen with a pop. Cue a "wow" moment when they see what they have drawn. We drew all sorts of things for him as requested. It was particularly engaging when the Monster uses these drawings to go on an adventure with you. However, it wasn’t long before Fred wanted to playfully subvert the Monsters requests. So when asked to draw an umbrella, Fred drew a cake. “Let’s see what he does with this heheh”– cue lots of laughter and it extended the play further. Fred happily plays with this independently and can often be heard conversing with the Monster. We tried out the Newton app as part of our science homework. As the name suggests, it’s a game with activities exploring the laws of gravity. The aim is to get the balls or marbles to the target. It requires no additional hands-on pieces and the app is free. Fred found it pretty difficult at first to make the lines you draw on the board directly affect the trajectory of the balls on the screen. We then realised instead of drawing you could place an object to alter the trajectory (like a pencil), but he still found it quite difficult to see. His older sister got it and proved a useful science exploration. In this game, a shape (made of tangrams) is shown on the screen, which you need to create with the real tangram shapes on the board. It offers hints if you place the shapes in a different way. This is a fun game which involves addition. The aim is to pop the numbered bubbles by placing the required number/dots on the board. It’s quite cleverly disguised so the kids didn’t even know they were using their maths skills. In order for it to be more accessible, I made the number dot pieces from the Kit more tactile with Bumpons. Having audio feedback when placing the dots/numbers would have really enhanced the experience for our VIPs. However there were lots of excited squeals when we got the sums right. When this happened, the bubbles popped on screen and we released the little fishes. Fred has just begun to show an interest in coding and this helped him to understand his coding actions. However it wasn’t particularly accessible for Fred to play independently. The blocks were OK for him to see – though they could have been bigger. To make it more accessible, you could make the blocks more tactile with raised arrows and numbers. Once again, audio feedback would have been helpful to navigate the coding steps and actions. The Osmo package as a whole is a little pricey, but it’s pretty unique in terms of using hands-on pieces with screen play. It really does extend the play value of an iPad and is a lot of fun and learning. It does what it says and brings the play beyond the screen. 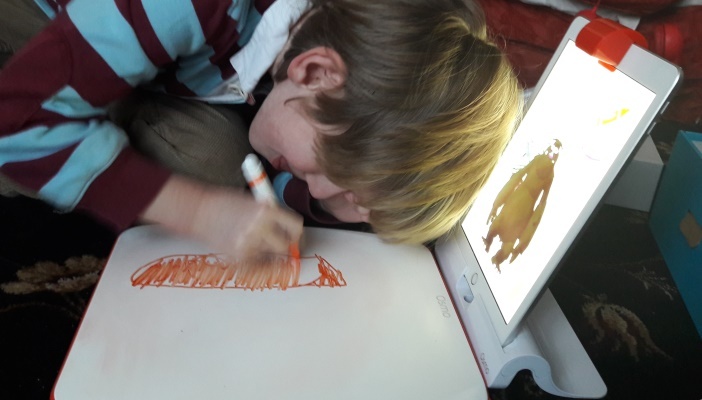 The tangible interface of The Monster drawing app continues to be our favourite and we have saved all the drawings for future play. I look forward to further updates and to try the other available apps which are free. The Monster was last seen flying off in a spaceship made of cake – yum! Karen and Rebecca Atkinson founded the #toylikeme campaign, which calls for toy manufacturers to make better representations of disability in their products.